Thanksgiving can sometimes seem like a hectic time of year, as the airports and roads are busier than ever, as we prep perfectly planned meals, and as our inboxes explode with Black Friday deals. But as they gather around their tables, Americans are taking the opportunity to pause and reflect on what they are thankful for, and at Seiden, we're no exception. 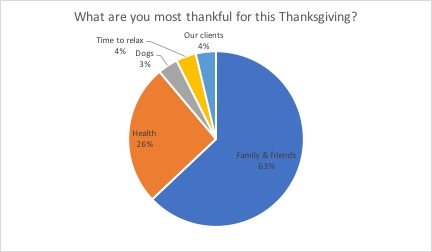 A poll of Seiden-ites shows that our loved ones are far and away what we’re most thankful for. Given our work in the healthcare space, you may not be surprised to see that many of us are most thankful for our health this time of year. We often hear stories of patients who’ve been through the unimaginable, and our exposure to this undoubtedly puts our own health and the health of our loved ones in perspective. To be sure, as mission-driven marketers who share common values, we’re often reminded on a daily basis of everything we have to be thankful for. 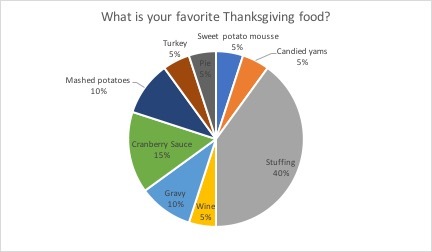 And with an office full of foodies, our Thanksgiving poll would not be complete without asking about the favorite Thanksgiving food at our tables last week. The hands-down winner? Stuffing. Wishing everyone a healthy and happy holiday season to be shared with those you love most!